Pemberton. Argent a cheveron between three buckets sable with hoops and handles or. Incorporated in Sir James Pemberton's own coat of arms. James Pemberton was born in Wrightington, said to have been the son of a farmer of nearby Heskin, in the parish of Eccleston in Lancashire. Eccleston lies just to the west of Chorley. 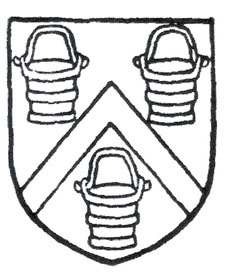 His coat of arms shows that he was descended from the armigerous family who lived from the 13th century in the settlement of that name: Pemberton, just to the south-west of Wigan. Branches of this family are recorded into the 17th century. He came down to London in 1567 and was apprenticed to Francis Heaton (Eton). As a goldsmith he prospered to the extent that, by 1597, he was able to found and endow a grammar school at Heskin. The school, for 200 boys, probably opened in 1600. It was managed by a body of twelve governors said to have been under the auspices of the Goldsmiths' Company and Brasenose College, Oxford, although neither have any record of this. He became Prime Warden of the Goldsiths' Company in 1600/01, was elected Alderman for Bishopsgate on 15 June 1602 and for Castle Baynard in 1603. A Sheriff, he was knighted in June 1603 (with 17 0ther Aldermen on the Accession of James I), and became Lord Mayor of London in 1611/12. 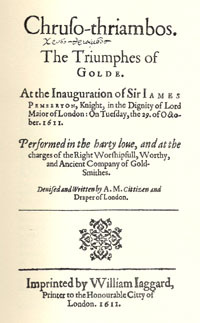 His election was celebrated by the Goldsmiths' Company on 29 October with a spectacular parade: a pageant (“Chruso-thriambos - The Triumphs of Gold”) written by Anthony Mundy (1560-1633), in which John Lowin, an apprentice of the Company turned actor took the principal role of Leofstane, another goldsmith claimed, incorrectly, to have been the first Lord Mayor of London. He married twice, first a member of the family of Yorkshire named Wyrhall, who died in August 1599. Two months later he married Anne Hadley, nee Barnard, widow of Richard Hadley, a Grocer. There do not appear to have been any children of either marriage. 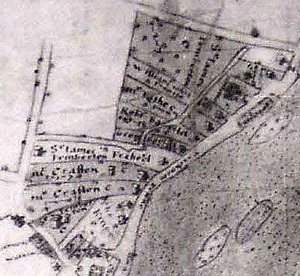 Pemberton had earlier bought or leased land and property in Twickenham, and this can be seen on the map of 1607 drawn by Ralph Tresswell the Younger. It includes freehold land, on which were two houses, running between Richmond Road and the River Thames, later taken into the garden of York House. A further triangular copyhold property, with a house, facing Church Street was near St Mary's Church. It too later became a part of the York House estate. He also took a lease, possibly from Sir Thomas Newenham; of the Crown estate then known as the Queen's Farm, on which the house later known as Orleans House was built by James Johnston in 1710. It seems likely that Pemberton, and members of his family, occupied a house on one or other of these holdings because, on 26 Nov 1593, his niece Martha (1576-1616), married Alexander Prescott at St Mary's Church, Twickenham (“Master Alexander Pescott & Pemerton Marthe” in the Register). Pemberton had the use of a pew in the church as noted in the Vestry minutes of 24 February 1632: “….where Alderman Pemberton did in his lyfe tyme sett…” Martha was the daughter of one of his brothers, perhaps Thomas or John, also a goldsmith, to whom Alexander had been apprenticed.. She was the recipient of a bequest of £200 as “Martha Prescott my niece” in his will. In 1607 Pemberton built himself a large mansion in Maiden Lane, next door to the Goldsmiths' Hall, known as Camden House. Maiden Lane was, in 1845 renamed Gresham Street West being, still later, subsumed into Gresham Street. It was here, at the gate of the mansion, that the pageant concluded its tour of the city, in 1611. At that time there was no official residence for the Lord Mayor. It was here too, according to the inscription on his memorial that he “being Sheriffe of this City, at the coming in of King JAMES, entertained neere 40, Earles and Barons in his house on the day of the Kings being proclaimed”. He desired to be buried in the Church of St Vedast, Foster Lane but he was, in fact buried in the Church of St John Zachary following his death on 8 September 1613. His memorial was erected in the church, composed by Anthony Mundy. The church was destroyed in the Great Fire of 1666, but the inscription was published in the 1618 edition of John Stow's Survey of London. Pemberton bequeathed the bulk of his estate to his wife Ann but the will (PCC Prob11/122), probably written in failing health, does not describe property in Twickenham, or anywhere else. His widow was pleased to describe herself as “Dame Ann Pemberton” in her long and repetitive will written in 1625, the year of her death (PCC Prob11/146). She was living in her “great mansion house” and held leases from the Goldsmiths' Company on six houses nearby which were let. All these properties were in Maiden Lane. There were other properties in the city and some perhaps in Essex which may have been from her family. There was no mention of properties in Twickenham. Pemberton may have disposed of some of his Twickenham properties during his lifetime, possibly to Alexander Prescott, whose family continued to own land and property in Twickenham throughout the 17th century. This did not include tenure of the Queen's Farm for which Andrew Pitcarne, a Groom of the Bedchamber, took a 30 year Crown lease in 1622. It is possible that Pitcarne also acquired Pemberton's other holdings of 1607 at this time: by 1635 he was engaged with the building of York House next door.